Sometimes you just want to stay inside in the cold of winter. Someplace cozy, in a comfortable chair next to a glowing red heater. A cup of cocoa warming your hands, and a good friend to keep you company. Maybe your dog is curled up, snoring, on fleecy dog bed in the corner. Maybe you’re snoring. You live for those weekends when there’s nothing to do but stare at a hole in the floor, and there’s absolutely no reason you should be worried about getting out your toolbox to fix it. After all, you put it there. Because it’s ice fishing season. 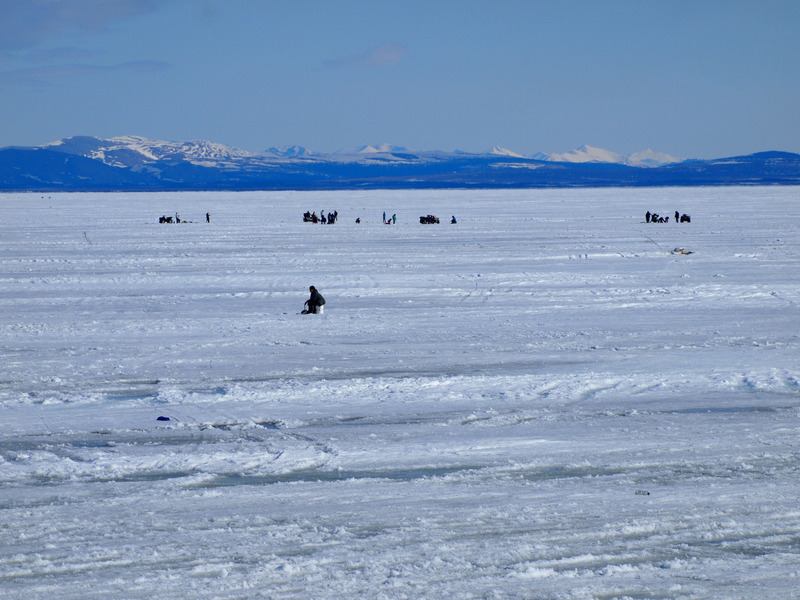 For many of us, angling is a summer activity, but for tens of thousands in North America alone ice fishing isn’t just the end-all, be-all winter sport: it’s essential for subsistence living. In any case, it’s a great way to bundle up and experience outdoor winter sports, even if you take the couch with you. The best places to ice fish tend to be the northern U.S. states, Canada, and Alaska. Obviously, the ice is more stable where it’s colder, and lakes and reservoirs are safer than rivers of any size. Ice fishing is huge in Minnesota and the Great Lakes states, but New York and the Northeastern U.S. have a rich ice fishing tradition, too. Anglers typically go after walleye, perch, Northern Pike, muskellunge (muskie), panfish, and trout, but you might hook into the occasional landlocked salmon. Bass are warm-water fish. Their metabolism slows down when it’s cold, and they’re not motivated to eat. People spend thousands on fishing gear depending on the body of water, depth, species, and their level of obsession. 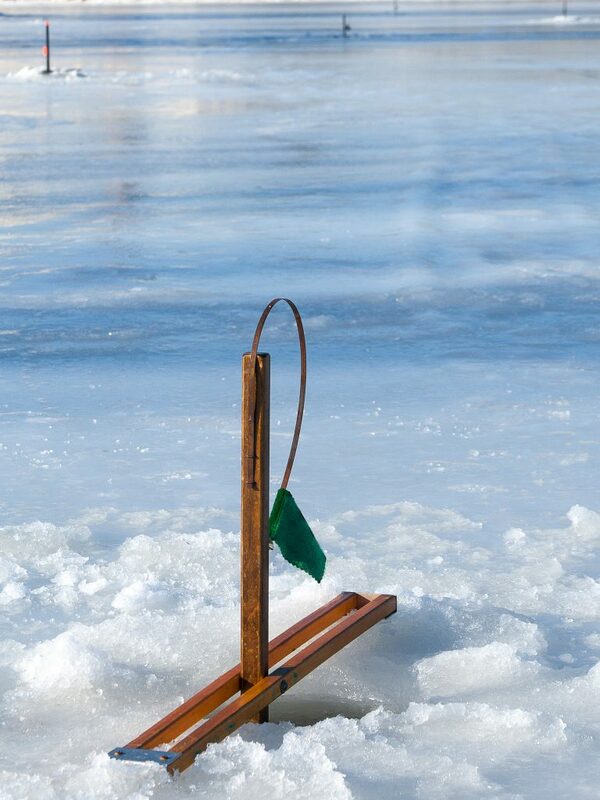 Ice fishing is a bit more straightforward. You’re not casting, after all. You just need gear that effectively allows you to lower your bait into the water, let you know when you’ve got a fish on, and bring it up without busting your rod or line. Photo from USFWS Midwest Region (© 2011 Some rights reserved). My stock answer for the “what’s the best entry level pole” question is “Shakespeare Ugly Stiik” for every type of fishing outside of fly casting. I have an Ugly Stik bass casting rod, Ugly Stik spinning rod, and an Ugly Stik ice fishing rod. It’s the hands-down most popular entry-to-intermediate level brand, and they have great ice fishing rod/reel combos for about thirty bucks. If you outgrow this model (and it will take a while), you can use it as a backup, or you can loan it to someone you’re indoctrinating into the sport of angling. If you already have a regular spinning or casting reel, you can use it for ice fishing. But the shorter rods are ideal for fishing in more confined shelters, and more controlled jigging action. My favorite line is PowerPro Ice-Tec. I’ll use 5lb test for panfish and perch on smaller ponds, and either 10lb or 15lb for pike on larger water. Standard fishing line will work in a pinch, but it may be more prone to snapping due to the frigid temperatures so throw down for the good stuff. Photo by Paul VanDerWerf (© 2014 Some rights reserved). Want to take a nap? You can fish hands-free with a tip-up device, which straddles the hole, secures the line, and signals when you’ve hooked a fish. Some models even keep the fishing hole from re-freezing. 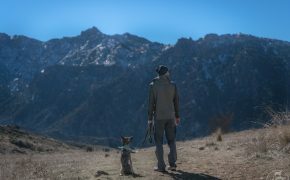 Tip-ups are absolutely worth looking into, but for the purposes of this article, I’ll just send you to this breakdown of gear, and encourage you to go “old school” your first trip out. Feeling that bite on your line is the best part of fishing. You’ll probably hear anglers warning you that “the tug is the drug,” and they’re right. You’ll be hooked. But if you’re allowed to fish with two lines at once, that’s where the tip-up system comes in handy. You can learn all about it in this in-depth video. Most traditional, warm-weather lures wiggle and “swim” as they’re reeled in. Ice fishing lures, on the other hand, are “worked” to resemble fish that had one too many shots of Rumple Minze; they float nose-up, or gently bob parallel to the surface. Here’s a good list of artificial lures, some of which are classic models used in warm-season fishing. You might even have a few in your tackle box (for sure, you should have the Kastmaster). Rigging lines for fresh bait is a bit more complicated than I’ll go into here because it involves fancy knots, crimping sleeves, and specific hooks, and each with a different purpose. A few good artificial lures in a variety of sizes will get you started, and likely bring you success your first time out. There are two basic ice fishing techniques: Set it and forget it, or raising and lowering the rod tip. The latter’s called “jigging,” and it captures the game fish’s attention while mimicking the baitfish’s natural behavior. Good news! You don’t have to saw a hole in the ice. Powered by hand or a motor, ice augers get the job done. You’ll find them in several sizes, but if you invest in only one auger, get one that drills 8″ holes. Anything larger compromises the surrounding ice, and anything less will make it difficult to land a surprise northern pike or muskie. If you’re certain you’ll only catch small perch, sunfish, or bluegills, a 5″ to 6″ hole will work fine, and you can easily drill it with a hand auger. Don’t forget to bring an ice scoop, which is essentially a perforated, long-handled ladle that removes ice buildup from your fishing hole. Photo from Joe Ross (© 2012 Some rights reserved). You can break into ice fishing with a pop-up tent, or you can go full bore with a luxury ice house fitted with a flat-screen TV, kitchen, and RV-style bathroom. 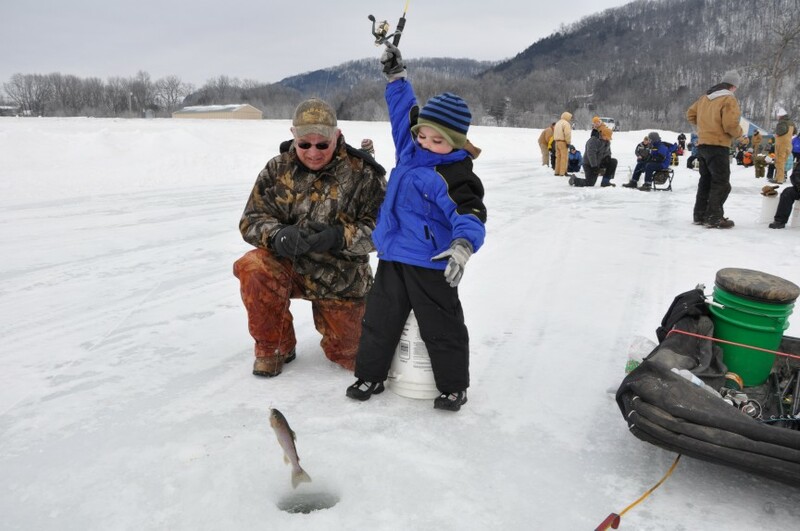 Ice fishing is like tailgating; in some regions, fishing fanatics hold cookouts at their spots, sharing pan-fried “catch-of-the-day” perch, venison or elk from that season’s hunt, or just burgers and brats. Hard-core tailgaters with money to burn invest in specially-outfitted party trailers, and die-hard ice anglers? Well, see for yourself. They’ll haul specialized RVs or structures on skids that rival trendy “tiny houses,” but with round floor hatches. But most ice anglers will either build their own plywood fish houses, or pack in a plastic sled stuffed with a collapsible tent, folding chairs, gear, and whatever amenities help them enjoy the day. Before you step off the bank, be certain that the ice is safe; you have a buddy (your dog doesn’t count); and you have the right self-rescue gear. 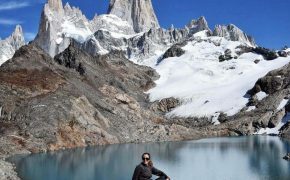 Dozens of people lose their lives while recreating on lake, pond, or river ice, whether they’re ice fishing, hiking, snowmobiling, or tooling around in their cars or ATVs. You’re looking for hard, clear, “blue” ice with no visible cracks. Definitely avoid black, pitted, slushy ice that’s spider webbed with frozen (or gapped) fissures. Ice is thickest closer to shore. As you travel further away, use your auger to drill test holes, and a measuring tape to gauge ice thickness. If you’re unsure, contact your local fish and game office, or check with a local sporting good store for conditions. Don’t go farther out on the ice than you feel is necessary; a map that shows lake depths can help you determine the right spots to set up. My favorite spots happen to be near shallow inlets, right where the bottom drops off to about 15 feet. These areas tend to have nice, sturdy ice to boot. Photo from Bureau of Land Management Oregon and Washington (© 2017 Some rights reserved). You’ll definitely want to wear ice cleats on your footwear so you don’t create a scene straight out of a cartoon. A serious fall can cause a traumatic brain injury or broken bones, which are no laughing matter. It’s a good idea to bring a ski or trekking pole to help keep your balance, or to assist if you or your buddy falls through. Buy or make a set of ice claws to wear around your neck. 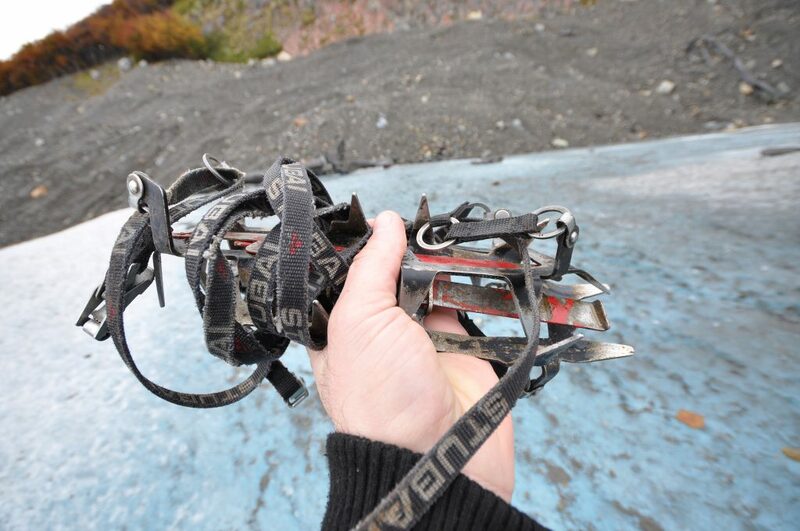 These “mini ice picks” will help you climb out if you go in. Even if you self-rescue after a fall through (or on) the ice, you’ll need help getting warmed up and back to dry land. 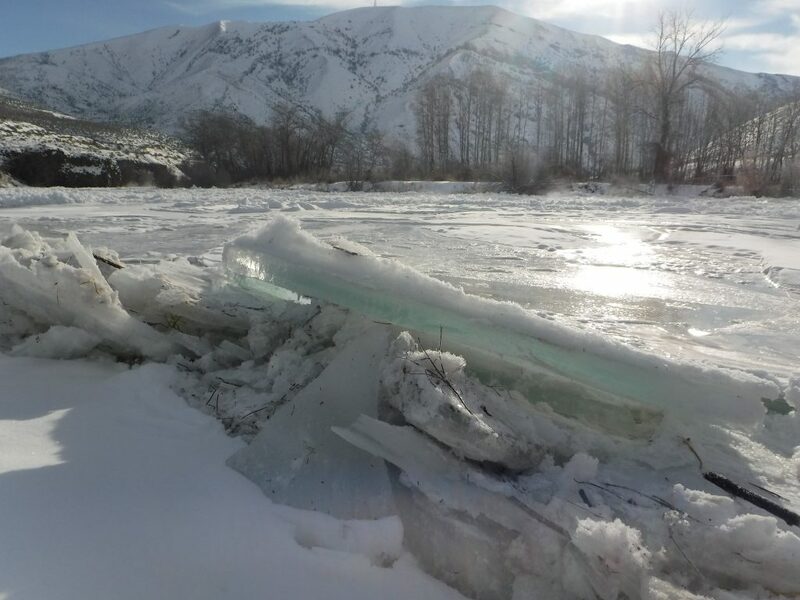 Keep at least a six feet distance between yourself and your fishing companion to lessen the chances you both get soaked if the ice breaks up beneath you. And if you have to assist your buddy, or find yourself on dangerous ice, lay flat to distribute your weight and scootch to your destination. Take one buddy with you, but leave word with friends or family when you’re leaving and when you plan to be back. Be as specific as you can about your location. If you’re bringing supplemental heat, be sure your source is safe to use indoors and that you pay attention to the user manual. Never set up a generator—or a portable grill, for that matter—inside a structure. If you brought a camp stove, use it outside and bring a wind blocker. Grab a decent first aid kit, and make sure there are forceps, wire cutters, a space blanket, ibuprofen, and hand warmers tucked in. Your most likely injuries are hypothermia, falls, and embedded hooks, but more than a few ice anglers suffer hangovers. While I strongly advise against drinking alcohol while on the ice, if you’re on a multi-day trip you’re bound to catch a headache the night before. Photo by Jorge Láscar (© 2011 Some rights reserved). Lakes and rivers tend to be lower than the surrounding terrain, serving as cold sinks. 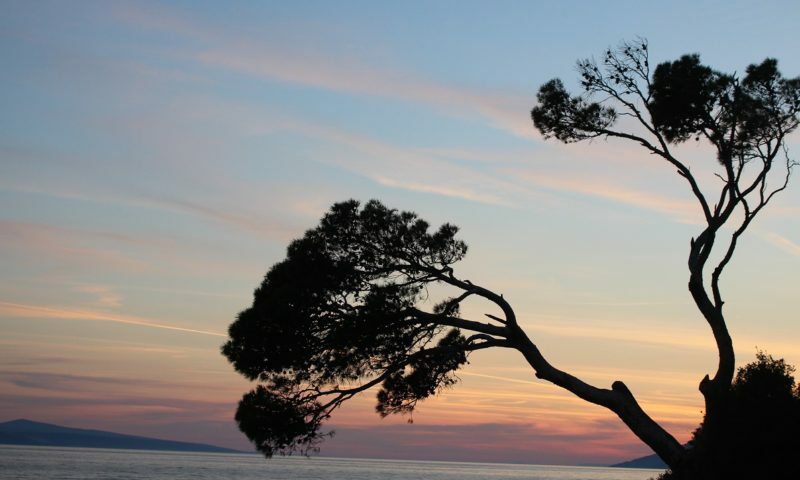 Water surfaces tend to be windier than shorelines, as there aren’t any structural breaks to slow it down or block the gales. Wear plenty of warm layers. You want breathable clothes to wear while you’re hauling your gear, and high-quality, insulating outer layers when you’re sitting next to your fishing hole… even if you do have a posh ice shelter. Wear a down parka with a hood, a warm wool hat, and insulated mittens to keep your extremities dry and warm. I prefer to wear wool, fingerless gloves under my mittens. I can pull off the latter when I’m bringing a wet, floppy fish to the surface, and if my wool gloves get damp, they’ll still keep me warm. This is important: Bring extra warm clothes and socks, and store them in a waterproof dry bag. If you get dunked, you’re going to want to change immediately. 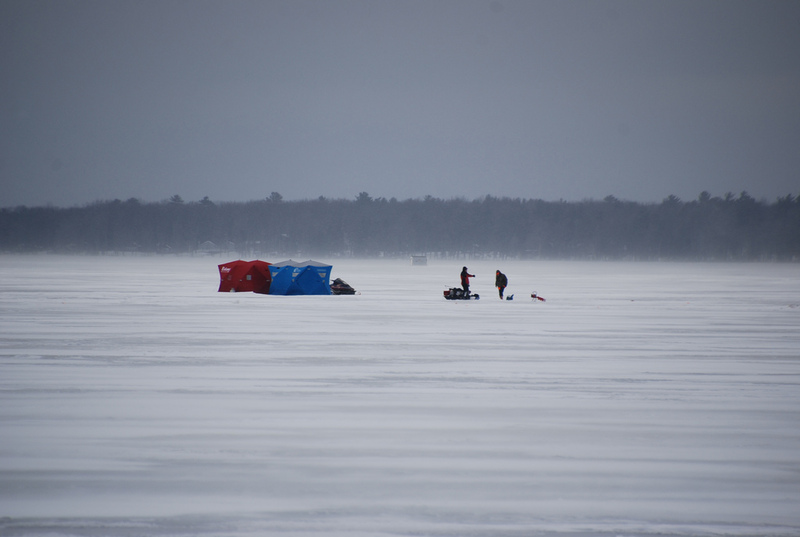 Ice fishing is the extreme sport counterpart to warm weather angling. It has its risks, and every waterway has its own underwater terrain and recommended techniques. Local fishing clubs help “newbies” get involved in the sport. You get helpful tips, and they help keep the sport viable. Individual anglers are often thrilled to find a companion, especially if you can chip in for gas or (moderately consumed) beer, or listen patiently to their favorite fish stories. You might even be able to borrow their gear and soak up their wisdom until you’re ready to invest in your own equipment. Look up a fishing club in your state here, or hop on to the best-known ice fishing forum, IceShanty.com. Just remember that most anglers hate it when they’re asked to divulge their favorite spots; play nice, be respectful, and let them warm up to you before you ask them to drag you into the cold. …is better than the best day working. I happen to love my job, but I also love a good book, a winter landscape, and the satisfaction of catching a bucketful of perch on a lazy Saturday. Ice fishing is something I can do with friends or family who aren’t into more strenuous sports, or with my nephew when he needs to catch up on his math homework miles away from his Xbox. I suppose I can get away with one more pun; ice fishing is pretty chill… at least until you hook your first monster pike. Featured image from Western Arctic National Parklands – © 2104 Some rights reserved.